People generally associate penal transportation with Australia, and for nearly a century (1788-1868) that was indeed the case. But for a period before that transportation was used as punishment, going to other destinations within the British Empire. Prior to the use of Australia, which came quickly after its discovery, there was another distinct phase of transportation. Both offered an alternative to death as punishment for the many capital crimes in the law. Before 1660, when Charles II came to the throne after the period of the Protectorate, the penalty for all capital crimes was death (the exception being petty larceny, where whipping was the prescribed punishment). Not all of those sentenced were killed, however, as benefit of clergy – being able to recite a passage from the Bible – was extensively used, the criminals effectively being discharged if they could do that, literate or not. The introduction of transportation allowed for the proper punishment of criminals without killing them while also putting them to good use. From 1718, after the Transportation Act was passed, transportation to the American colonies and also to the West Indies was introduced, and became, more and more, a replacement for capital punishment. There were two types of offences for which a person could be transported. The first was known as a “clergyable” offence and gave transportation for seven years (petty larceny could now also be punished this way). With a non-clergyable capital offence, transportation was for 14 years and relied on the King’s pardon for it to be an alternative to hanging. In all cases there was a direct similarity between the transportation of the convicts and indentured labourers. For the period of their sentence the convicts had to labour. The merchants who transported the convicts for the Crown effectively owned them, being paid £3 to take them overseas and they sold them on once they reached the colonies. Once the convicts were at sea, English law was no longer interested in them unless they returned before the period of transportation was complete, in which case they’d be put to death. Three of the colonies took the majority of convicts. Virginia, Maryland and Pennsylvania all had a large convict population, although they were never penal colonies. 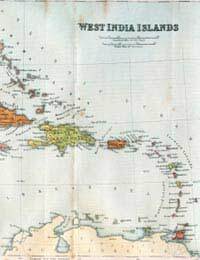 Others went to the West Indies, primarily Jamaica. This was about as close to a death sentence as transportation came, although where a convict ended up was pure chance. The heat and incidence of fever meant that many died there. Those deaths weren’t limited to convicts. Even among troops posted there, the Indies were seen as a likely place to die. The convicts were more heavily supervised than indentured labourers, and punished with whippings and chains (they did have a right of appeal to be fed and clothed and not punished too harshly). Unlike those indentured, they weren’t paid. At the end of their term they had nothing save their ticket of leave to show they’d completed their sentences. Many did stay on in the colonies, while some returned home. As no figures were kept it’s impossible to offer any kind of accurate tally. A total of around 50,000 people were transported from Britain (which then included Ireland) to the Americas. Transportation to America ended with the War of Independence in 1776. The Indies weren’t large enough to take all those requiring transportation. Canada was considered, but it’s proximity to the rebellious states made politicians believe that convicts could develop ideas of insurrection. They needed a new place to send convicts. That was why Australia was ideal, and could be used purely as a penal colony. Twelve years after the last convicts were sent to America, the First Fleet left England for Australia, and transportation there would continue for nearly a century.